Pentecost is my favorite day of the liturgical year. It marks the birthday of the church and reminds us all of our confirmation. It is the day the Holy Spirit came down on to the apostles and they went forth, with a fire in their bellies proclaiming the good news of the Lord. This year I started a new tradition: a Pentecost party! 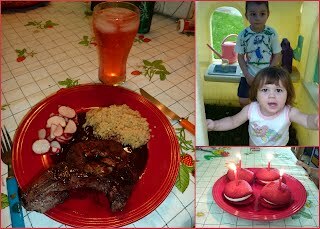 We celebrated it by eating red foods and drinking red drinks. Our menu included garlic pork chops with a wine pan sauce, pickled radishes, and some dainty pasta. To drink we had cherry 7-up, and our dessert were red velvet whoopie pies. Perhaps the meal wasn't the healthiest, but we had fun with it! I linked up at Catholic Cuisine, so check them out for more Pentecost Parties that happened! Very cool! Do you think you'll have another red inspired Pentecost Party this year? I taught this lesson already in my RE class since it ended in April and we made the Pentecost Flames Cupcakes. It was fun!